The 19002 is used to mount a Campbell Scientific enclosure to a tripod mast or to a user-supplied pole with a 1.25" to 2.1" outer diameter. The 19002 is option -MM when it's ordered with the enclosure. 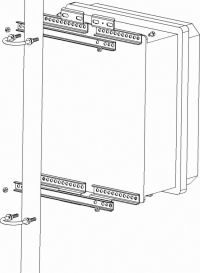 The 19002 consists of a three-piece bracket that attaches to the top of the enclosure and an identical three-piece bracket that attaches to the bottom of the enclosure. Each bracket is fastened to the mast or pole via a u-bolt.